Beautiful engraved RARE specimen certificate from the Township of Tel-Aviv dated in 1922. This historic document was printed by American Bank Note Company and has an ornate border around it with a vignette of the Township of Tel-Aviv coat of arms. This item has the printed signatures of the Company's President and Secretary and is over 86 years old. Written in Hebrew and English. 40 coupons attached on right side. 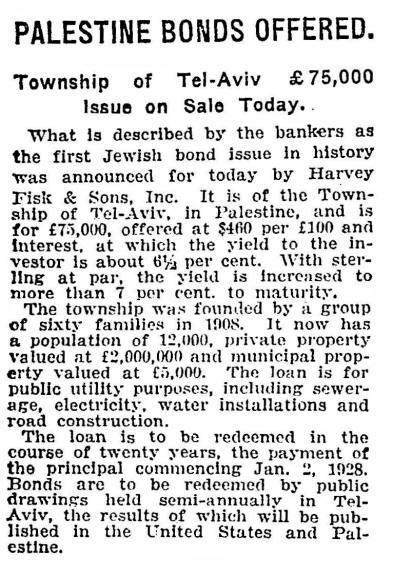 First Jewish Municipal Bond Issue. The first Jewish municipal bond issued in history, amounting to $80,000 has been authorized by the Palestine Government for the township of Tel Aviv. The obligations are secured by taxation, the bonds being issued at six per cent, payable in twenty years. Bernard A. Rosenblatt, American member of the Zionist Executive of Palestine, is coming to New York to arrange for the underwriting of the loan.